Two of Pentacles card has a double meaning. It can be a decline from variability to stability, or a struggle between balance and instability. This card often tends to appear in a spread for a person with a non-permanent personality and many conflicts. Naturally, this kind person will be in a constant fight between the subtle mind and lightheadedness, altruism and selfishness, greed and generosity. Two of Pentacles suggests that this person has the ability to deal with downs as well as ups. If this card happens to appear when practicing divination on a specific situation, the Two of Pentacles warns that there is a probability of you becoming a puppet in someone else’s hands or on the contrary, you will have a desire to control someone. You should fight with both situations, because both don’t predict anything good. This card strongly advises not to make any doubtful investments in a near future, and in general to limit any implementation of any transaction related to money, until better times. In relation to the Major Arcana, Two of Pentacles reminds you that any situation has a couple of different approaches to it and that you should think about it. 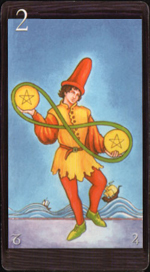 Two of Pentacles tarot card represents a harmonious change, which brings benefits. This card can also mean an ability to recognize great time cycles and to use them properly. This card means you can play with changes and extract practical benefits from them. It requires good strategist and coordinator abilities. You cannot tolerate restriction. Two of Pentacles could mean a surge of strength, energy, an ability to perform a certain job very well. Two of Pentacles, however, at the same time, may indicate a decreased development of new projects, because your attention is somewhere else. Weakness, lethargy, lack of energy, a situation where there is work to do, but the man is lying on a couch unable to proceed with it. Fear of future work. In lowest position Two of Pentacles gives unwillingness to work.